The Thursday Interview: Pete Tarsi, author of "Flipping the Scales"
Pete Tarsi, author of "Flipping the Scales"
Today I'd like welcome Pete Tarsi, author of "Flipping the Scales" to the Thursday interview. Before we get started, a quick intro! Pete Tarsi graduated college with a degree in Creative Writing and Physics, and he considers himself fortunate that he gets to do both for a living. When he’s not writing, he can be found teaching high school science, directing theatre, or spending time with his three wonderful daughters. He grew up in a small town near Boston and still lives in Massachusetts. We have laws for a reason: to protect society. For the most part, the laws work, but just like any rule, there are exceptions. I have three young daughters, and if protecting or saving them from harm meant breaking the law, then I’d have no other choice. I’m a science teacher, so I’m going to give a clinical definition of being alive. To be alive is to metabolize energy by taking in nutrients and then excreting waste products. But truly living is to connect, to explore, to create, to experience, to be passionate about something. The world is a big place with lots of things to see and do, and we’re only in the world for a short amount of time. I’m pleased that I’ve gotten to do many of the things I’ve wanted to, but there’s so much more I want to do. I love to create, and back in high school, I started putting pen to paper to write short stories because I had lots of ideas. They were really short, and they were mostly simple premises with dialogue, but I enjoyed it. In college, I took more writing classes and learned a lot about the craft. But like any endeavor, you get better with practice—by writing more and reading a lot. I still have lots of ideas, and I find myself motivated now by my children. I want to write stories that I hope they’d like to read. Maybe humans have an instinct to reproduce. I wanted children because I wanted to share and teach them. Now that I have three, I understand so many other reasons to want children. I love them unconditionally and effortlessly. I love my job, I love writing, and I have loved significant others, but all of those loves require(d) work in some form. I just look at my daughters and I know I love them and that they love me. No.5 What was the biggest challenge in creating your book "Flipping The Scales" ? I started writing without an ending. A friend of mine convinced me to participate in NaNoWriMo with her. I insisted that I didn’t have a story to write, but she reminded me of the mermaid idea I had. I didn’t know how it ended, I didn’t know who the characters were, I didn’t know what they were going to learn about themselves along the way, and I really didn’t know the full plot. All I knew what that a girl and a mermaid were going to switch places due to a shimmery skirt-thing. But I started writing, giving the characters basic traits that I could expand upon in revisions. About a week or so later, I bolted up in bed one night because I had figured out the ending. I jotted it down, and over the next few days, I drafted the final four chapters. Then it was a game of connect-the-dots to get there, but the writing became easier. Now the challenge is writing the sequel! No.7 How did you come up with the title "Flipping the Scales" ? I love puns, and I love titles that have more than one interpretation. The basic idea of the story is that a girl and a mermaid switch places. Their lives are turned upside down … their lives are flipped upside down. Then I thought of the expression tipping the scales, and that seemed cool because it was all about changing balance, and it had the word scales in it. 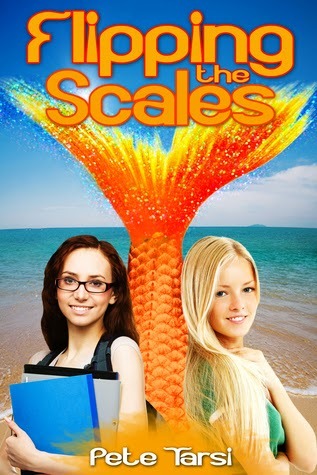 Mermaids have scales! And mermaids flip their tails. Putting it all together made Flipping the Scales, and that has such a great sound to it, and it fits the story so nicely. As a teacher, part of my job is to correct my students when they make a mistake. I think sometimes people have the misconception that being wrong is a failure. We learn from our mistakes. When I do something wrong, I want to know about it. Likewise, when I write a book, I share it with a few trusted readers first, and I want to know what parts of the book don’t work for them. As long as the criticism is being presented respectfully, I’m open to it. Obviously, if you love mermaids, you should definitely read it. But the fact that there are mermaid characters doesn’t diminish the messages in the story. The characters and lessons learned are relatable not only to teen readers, but to everyone who was at one point a teen. If you’re looking for something fun and appropriate for all ages, then my book’s for you. As Billy Preston sang, “Nothin’ from nothin’ leaves nothin’ / You gotta have somethin’ if you wanna be with me.” So if there were nothing, then we can make nothing. Since I’ve created many somethings—my children, my stories, and the answers to these questions—there can therefore not be nothing. Meredith and Marina’s lives have been flipped upside down. When the translucent skirt that straight-A-student Meredith finds hidden on the beach gets wet, it transforms her legs into a mermaid tail. Despite the evidence in front of her, she insists that becoming a mythical creature isn’t scientifically possible. Marina is allowed to experience one day per moon cycle among the humans. After hiding her tail on the beach that morning, she takes her first timid steps on land. When she returns at sunset to find it missing, she is left stranded and alone. For the first time in her life, Meredith doesn’t have all the answers. As she searches for a way to return to normal before the next full moon, she makes waves among the school of mermaids. Meanwhile, Marina uncovers information about her past, and for the first time in her life, she must stand on her own two feet and take the lead on her own adventure. As Meredith senses her human side slipping away, a forbidden way to change back entices her. But it comes with a consequence: Marina wouldn’t be able to return to the ocean.